1 | what a dog's life! Can you imagine renting a dog? I know that my Alphas have to PAY other humans if they can’t look after us. So this is the other way round… Quite unfair and sad for the K9s, I think! A dog is supposed to be for life – but can now be for only a weekend or even just a day thanks to a new pet rental service. Dog lovers who do not have the time or space to keep a full-time pet can hire a part-time one with Flexpetz, an American company setting up in the UK. 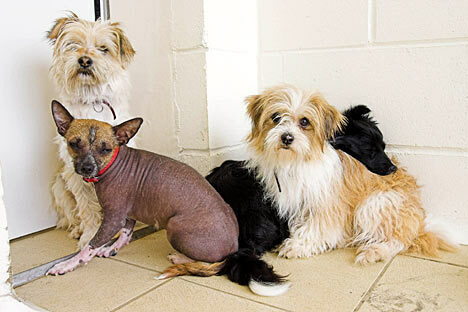 But the new dog borrowing scheme has been heavily criticised by animal charities who say it is cruel because renting out dogs like a “timeshare” only serves to confuse and upset them. However, such is demand for the service that 100 people in the UK signed up to the members-only scheme before it was even recently launched, after proving popular in the US. The new London branch currently has five dogs, with most of the animals retired show dogs, which have received full obedience training, and are checked by vets every three months. They are also fitted with tracking collars in case they are lost. Members pay an annual fee of £50, a monthly subscription of £49, and £30 per visit by “their” dog. The fees cover leads, bowls, beds and food which are supplied for every trip. Marlena Cervantes, a behavioural therapist who launched the service, said that ideally the dogs are shared by only two or three “owners”, and live in a kennel the rest of the time. “Our members are responsible in that they realise full-time ownership is not an option,” she said. “They range from a five-year-old girl whose parents work full-time to a 65-year-old woman who’s not physically able to walk a dog every day. “The demand has been incredible and although we only have five dogs at the London branch we are going to significantly increase that number. “And we are seriously considering opening more branches across the UK. But the idea of sharing a dog between multiple “owners” has been questioned by animal welfare charities. Kennel Club Secretary, Caroline Kisko, said: “It is with deep concern that the Kennel Club has heard about FlexPetz. “The concept of renting out dogs as a ‘timeshare’ equivalent is detrimental to the dog, leading to all kinds of confusion for the animal. “It also raises many questions about the kind of person who is making money at the dog’s expense, what happens when the dog gets older and no one wants it, and what happens in the situation where people who are renting the dog don’t want to give it back? There are already many ways in which dog lovers can get access to dogs, even if they don’t have time or space to own one, she added. “These include volunteering to walk dogs from a local rescue centre, or helping dog related charities which run schemes to send their dogs ‘out’ for the weekend to socialise while they are in training, such as Hearing Dogs for Deaf People,’ she said. Dogs Trust behaviour advisor Vicki Horsley said: “One critical element of responsible ownership is the commitment to care for a dog for the whole of their lives and not to regard them as disposable. “Rent-a-dog schemes simply encourages a throw-away attitude that so often leads to dogs ending in rehoming centres. Pet charity Blue Cross animal behaviourist Ryan Neile said: “When a dog is passed around from one person or home to another, they may become confused, distressed and unpredictable.